Friendship – when I hear this word, I feel to know the essence of it. This is the word which is one of the most common word in terms of relationship and there is different meaning for all of us. 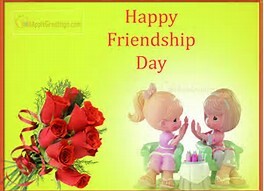 In other words, to understand and realize the connection with the word ‘Friendship’ there are different levels of understanding which take place as per the evolution and understanding of people. From my understanding every relation whether it is the relation of Son, Daughter, Wife, Husband, Friends, Disciple – each and every relationship has layers and levels but there has to be one essence, one core point. We need to understand that essence of relationship. If I am a disciple then what could be the essence of discipleship, if I am Son to my father and mother then what could be the essence of being a Son, if I am a friend to someone then what could be the essence of friendship… Realization of Friendship is one of the fulfilling aspects in life and from my understanding it happens with grace of God and Guru. By intellect, we can understand the meaning of friendship but to realize the essence we need grace and support of God and Guru in the form of faith and living in their teachings. I am saying this because in the course of experiencing friendship, many hurdles and obstructions come in the form of ego, doubt, and difference of opinions. These hurdles are the testing ground and we need to overcome them as we grow in our relation. An understanding should take place in our life with acceptance that we have difference of opinions with our friends but above all, there is a point where these obstructions cannot reach. That is the point of faith. In the friendship, faith plays an important role. When we develop faith, we feel that we can share anything with that person to whom we see as our real friend. On this point, it is a reality that there might be many friends but amongst all there is one person with whom we experience the essence of friendship. Once we realize this fact then friendship takes the form of freedom. There is possibility where we feel the golden word, “UNCONDIOTIONAL”. The essence of friendship can only be unconditional. With this realization, we may reach at that point where it can be said and felt that I am his or her friend rather he or she is my friend.